The Epic Fantasy genre has traditionally had a big problem with a lot of novels in it being accused of being clichéd and of having too many similarities to Lord of the Rings or other earlier Fantasy works. There are several different ways that an author of a new Epic Fantasy series can approach this problem – they can either write something original and innovative that avoids the clichés, ignore the risk of seeming clichéd and write what they want regardless of originality or use some clichés, but attempt to subvert them or satirise them. 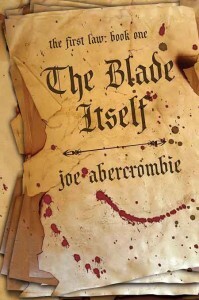 Joe Abercrombie’s “The First Law” trilogy takes the latter approach, while the plot summary sounds extremely derivative is it a more intelligent and more unpredictable work than it first appears to be. Most of the story is set in the generically-named nation of the Union, a stagnating but powerful empire that finds it has complacently stumbled into a situation where it is menaced on two fronts. In the North the Union province of Angland is under threat from the barbarous Northmen, a race of hard but undisciplined fighters who have been united for the first time in their history by the ruthless King Bethod, a man with some sinister allies. In the South the Union is threatened by the might of the vast Gurkish Empire, an Empire supposedly ruled by an equally ruthless Emperor, but in reality dominated by Khalul, a cannibal sorcerer who claims to be a Prophet. The Union has a decrepit King with two worthless heirs, an army severely weakened by the incompetence of many of its nobleman officers and a nation whose working classes are increasingly rebellious and whose ruling classes are busy fighting each other for power and influence. The narrative focuses on a number of different characters. Legendary Northman warrior Logen Ninefingers, a berserker in battle but surprisingly thoughtful out of it, finds himself exiled from the North by Bethod and working for Bayaz, First of the Magi, a devious sorcerer with a centuries-old rivalry against Khalul. Logen’s old band of warriors, believing their leader dead after he disappears over a cliff during a skirmish, find themselves trying to oppose Bethod in any way possible, even if it means allying themselves with the Union forces they regard as weaklings. Young nobleman Jezal Luthar is one of the Union’s most feted young swordsmen, favourite to win the national duelling contest despite his vanity, self-centredness and lack of any real-world experience beyond duelling and playing cards. Major West is Jezal’s friend and fellow officer, a war veteran who has risen high despite his common roots but finds himself limited by his quick temper and the prejudices of officials with more noble backgrounds, as well as having to look after his witty but vulnerable younger sister Ardee. Ferro is a bitter former Gurkish slave, now desperate to use her fighting talents against her erstwhile captors. So far, the plot summary and character list probably makes this sound like a typical fantasy novel, and to some extent it is. However, nothing is quite as simple as it seems – Bayaz for example is far more than the Gandalf figure he might first appear and his ruthlessness becomes increasingly clear as the series goes on. Logen’s world-weary approach to life is equally far from what his bloodthirsty background and reputation would suggest. Some of the character arcs are occasionally predictable, Jezal for example becomes less self-involved as the series goes on, but others are more surprising, West’s character arc for example has a couple of unexpected twists in it. The final major character in it is probably the least clichéd of them, and definitely the most interesting. Inquisitor Glotka is a former war hero who was once a young, noble, pleasure-loving, hard-fighting swordsman not unlike Jezal. That was before he was captured by the Gurkish in a previous war, while the regiment he commanded was slaughtered around him. Glotka was tortured for five years by the Gurkish before being released a shell of his former self, disfigured and crippled and avoided by his former friends. He eventually found employment working for the Union’s own Inquisition, the secret police who do more than a little bit of torture themselves. Glokta is in many ways an unsympathetic character, almost all empathy for others having been tortured out of him, but his struggles against his crippling injuries, his wry humour, his dogged pursuit of the truth even when his superiors are uninterested and the occasional glimpses of some remaining humanity make him the most interesting character in the books. Abercrombie’s writing style is witty and fast-moving with memorable dialogue and efficient descriptions of the action scenes. The characters may begin as simple archetypes but they are quickly given greater depth and all the major characters have their own individual voice and way of looking at the world. Most of the minor characters are done similarly well, although there are a few that lack any apparent depth such as the continually boasting Longfoot who is Bayaz’s guide. This isn’t a book which goes into any great detail about description of the landscape the characters are passing through and what exposition there is about the mythology of the world is delivered concisely and an interesting way. Although this book is fairly low on magic the occasional bits which have more supernatural elements – such as Bayaz’s expedition into his old master Kanedias’ tower – are an effective contrast to the relatively mundane scenes in the rest of the book. The plot is generally unpredictable and although a bit slow to start off with, it does start to become compelling during The Blade Itself. However, if there is one thing to criticise about The Blade Itself, it is that it does sometimes feel like more of a prologue to the main action. Although Jezal’s preparation for the Contest and Glotka’s investigation of the corrupt Mercer’s Guild are interesting plotlines and introduce the characters well they do feel a bit peripheral to the main storyline and by the end of the book very little progress has been made about fighting either Bethod or Khalul. In summary, this is a very entertaining book with memorable characterisation and the beginnings of an interesting plot. However, the lack of plot progression does mean that judged on its own The Blade Itself feels more like setup for the later books than a great book on its own merits.